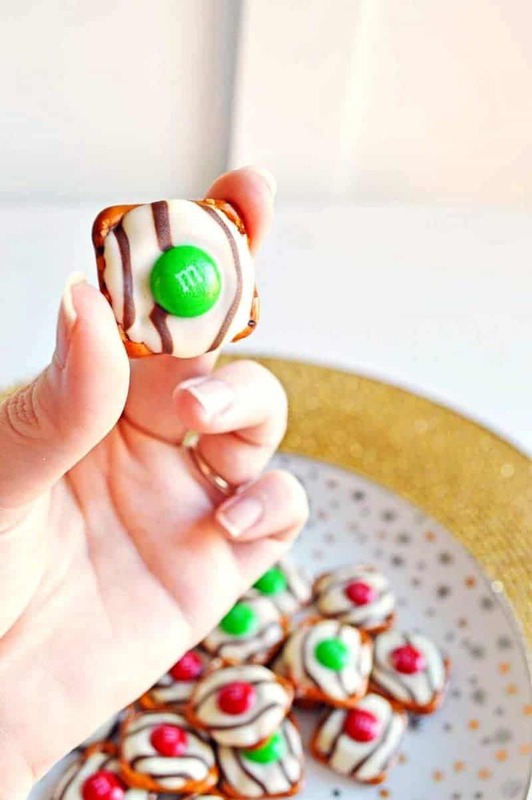 Salty-sweet Christmas pretzel hugs treats are quick and easy to make with just 3 ingredients: square pretzels, M&Ms, and Hershey's Hugs. It’s such a lifesaver to have quick and easy recipes available for the holidays. 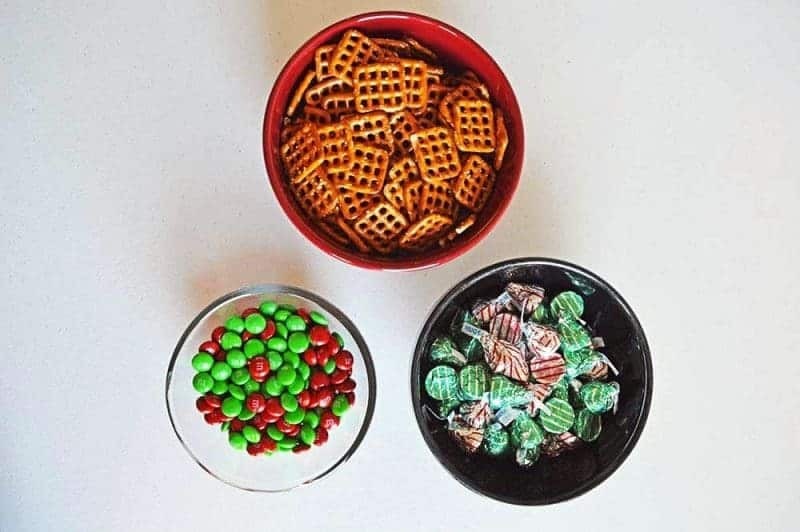 Not only are they great for when you have company coming over on short notice, but they are also perfect for when your kids need a treat for school and didn’t tell you until the last minute. 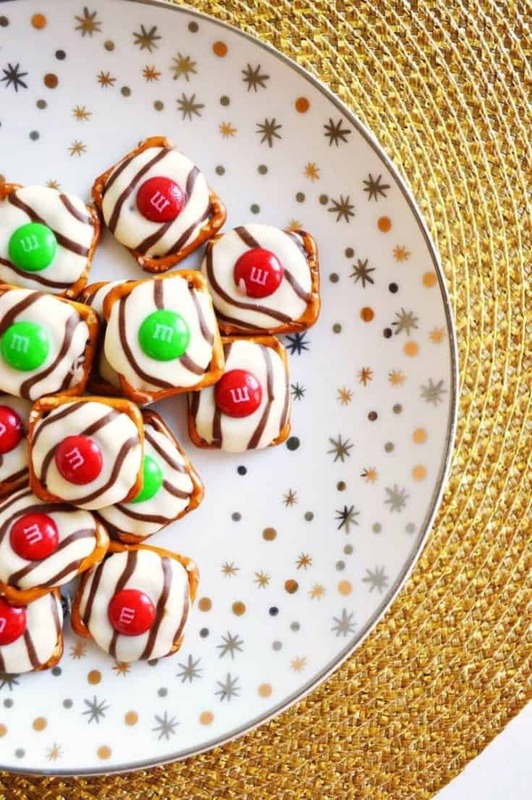 These Christmas Pretzels Hugs will be one of your go-to treats. 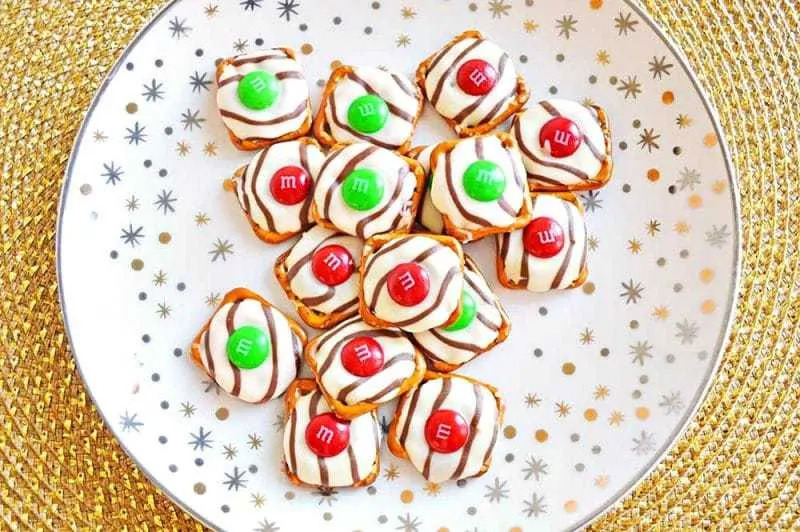 With only three ingredients, you can throw these adorable treats together in less than 15 minutes. Your older kids can even make these on their own. That’s how simple this recipe is. If your kids are old enough to use the oven, they can make these Christmas Pretzel Hugs. Another plus is that this recipe makes a lot. You’ll end up with sixty. If you need more than that just double the recipe. These make perfect gifts. You can put them in a cute tin or treat bag for a gift for coworkers or neighbors. It’s something that’s homemade and from the heart, but took just a few minutes to make. 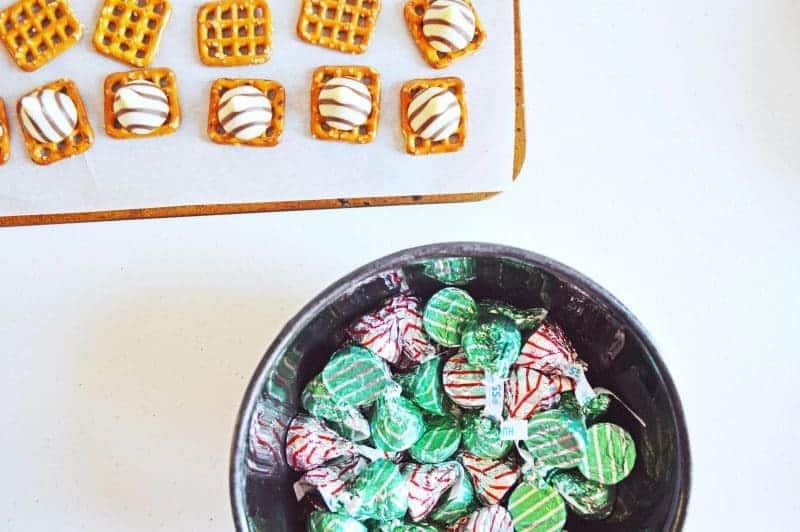 You’ll love being able to make treats for everyone on your list without spending the entire day doing it. If you’re looking for an easy, quick, delicious recipe for the holidays, these 3-ingredient Christmas pretzel hugs will be perfect. Preheat oven to 200 degrees. Cover a cookie sheet with parchment paper or a silicone baking mat. 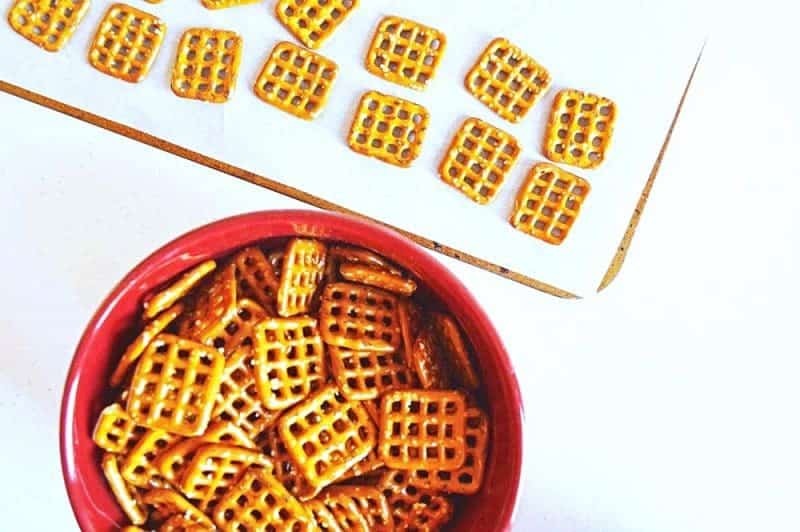 Lay pretzels on cookie sheet in a single layer. Top each pretzel with a Hershey's Hug. Bake until the kisses are on the verge of melting but still have their shape (about 4 minutes). Once removed from oven, immediately place an M&M in the center of each and push it down to spread out the hug. Chill in the refrigerator for 30 – 60 minutes before enjoying. That's it – a super simple recipe! 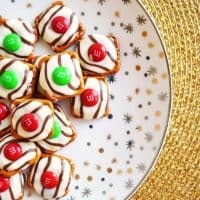 I hope that you enjoyed this quick and easy Christmas Pretzel Hugs recipe and that you and your family have a very happy holiday! 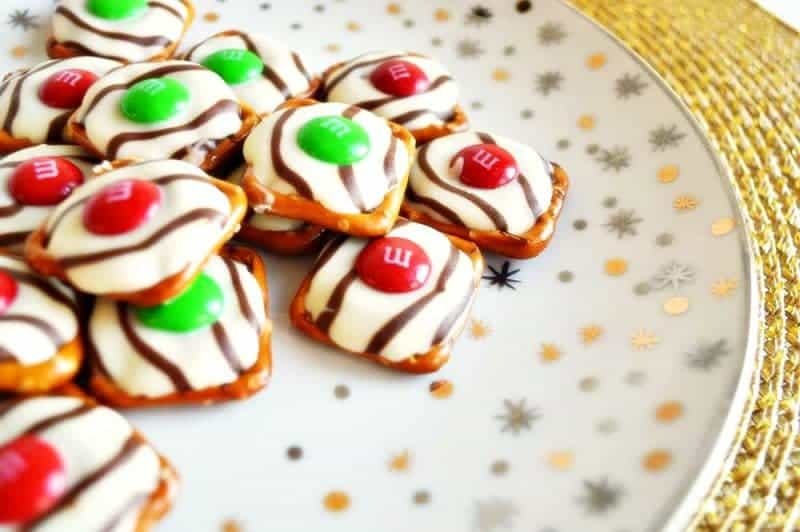 Salty-sweet Christmas pretzel hugs treats are quick and easy to make with just 3 ingredients! Cover a cookie sheet with parchment paper or a silicone baking mat. Lay pretzels on cookie sheet in a single layer. Top each pretzel with a Hershey's Hug. Bake until the kisses are on the verge of melting but still have their shape (about 4 minutes). Once removed from oven, immediately place an M&M in the center of each and push it down to spread out the hug. Chill in the refrigerator for 30 - 60 minutes before enjoying. This is the perfect recipe. Something quick and easy. Great idea, can’t wit o try them on my great grands when they come by this weekend!! Love that these are SO easy and look SO cute!! There aren’t many things out there like that 😉 Plus delish!! Thanks for the recipe. Perfect for this time of year! These look so yummy and easy to make! It’s been a couple of years since Ive made holiday treats, as they got too complicated for me. THIS is something I can do quick and they go over well for kids and adults. And LOOK like they are very festive!